Gulf Craft has completed the second hull of the Majesty 125 series, a 38.4 metre motor yacht called Marina Wonder. The Majesty 125 was introduced in 2010 with the launch of Grenadines III. At that time she was the second trideck built by Gulf Craft after the launch of the Majesty 130 named De Lisle III in 2007. This series is still the second largest model produced by the Middle East yard. Marina Wonder is a customised version of the Majesty 125 with decks modified for a spa pool with sun pads, and bespoke furniture selected by the owner. Inside, the five-cabin layout is similar to that of Grenadines III, accommodating 10 guests in a full-beam master on the main deck and four double cabins on the lower deck. The interior design combines warm American cherrywood, onyx stone and solid white oak French parquet. Built in composite, her semi-displacement hull is powered by twin 2,400hp MTU engines giving a top speed of 23 knots and a range of 2,000 nautical miles at 12 knots. Like her sister, Marina Wonder will be based on the Côte d'Azur. 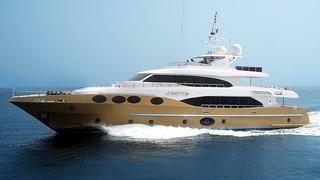 She's the fourth 30m+ yacht to be delivered in 2012 by Gulf Craft, and will be on show at the forthcoming Monaco Yacht Show.